The guys over at Did You Know Gaming have covered many Zelda games, as well as other aspects of the franchise, over the years. In one of their more recent videos they look into The Wind Waker featuring the one and only PeanutButterGamer. See the video after the jump. 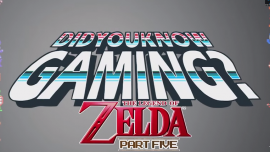 The folks over at Did You Know Gaming have released another Zelda themed video, this time delving into some of the most interesting facts about the music in the series. Gaming Youtuber SpaceHamster provides the voice for this particular episode, and it mentions plenty of great music trivia, from the original planned song for The Legend of Zelda to Koji Kondo’s endeavour for an orchestral score in Twilight Princess. Make the jump to check out the video! DidYouKnowGaming is a website focused on making tons of informational video content surrounding little-known trivia in video games; they’ve made hundreds of videos about different game series and gaming consoles, and constantly update their site with small facts about games in general. While Majora’s Mask itself is a game shrouded in enough mystery as is, it would seem there are more truths to uncover within the game’s data. 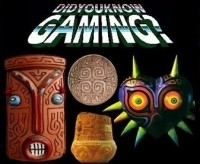 According to Did You Know Gaming, a code found in the game suggests that Skull Kid was originally intended to wear three other masks. Hit the jump for Did You Know Gaming’s report. Those of you familiar with Did You Know Gaming and their occasional tidbits from Legend of Zelda series on YouTube might have noticed that it’s been a little over a year since their last Zelda video. Along with their compilation of new tidbits that you may or may not have known, the video also features a narration from YouTuber, JonTron. Hit the jump to watch the video! Activate your trivia mode. There’s a 99% chance you’ll find this episode of “Did You Know Gaming?” interesting. DYKG teams up with our lord and savior JonTron for this episode. The six minute video tackles the development cycle of remake to new game across the Zelda series. The team also unscrambles some of the gibberish spoken by Chuchus and Midna. We even get a look into Eiji Aonuma’s marriage. What a juicy scoop, eh? Check out the video inside!